If it's not already on your wishlist, then hopefully you've already bought the GHD Scarlet Collection Set ($225) for all your holiday primping. 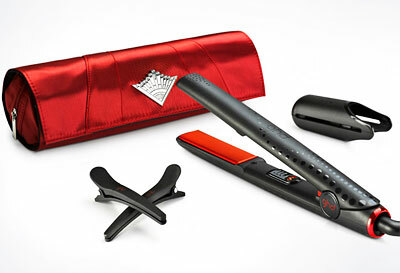 You get the GHD Gold Professional flat iron that's perfect for straightening and curling your hair, two sectioning clips and a bold red clutch. It's big enough to tote your flat iron for traveling and finished enough to proudly wear with your holiday party dress. The art deco accents are right on trend and the perfect embellishments to this dressed up clutch that easily fits your phone, makeup, keys and other necessities. So, yes, for the price of just the flat iron, you get an additional hair clips for easy styling and clutch that's perfect for partying.